C-Series desks from Invincible Furniture. Traditional “stick leg” teachers desk design (1" heavy gauge steel) featuring legs with the “chrome look” (Environmentally friendly powder coat). Back modesty panel 3/4 height, 3/4 Pedestals (letter width with high sides and one steel divider in box drawers). 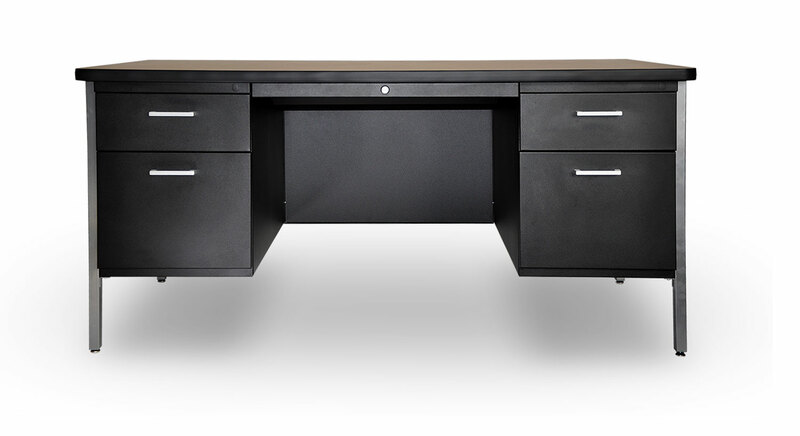 Center drawer is standard in all desks and has a central locking system that locks all the desk pedestal drawers. 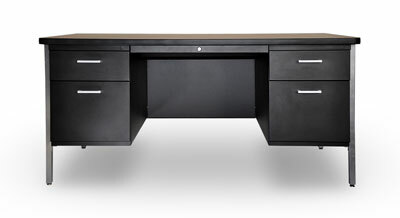 Desks keyed at random unless specified differently. Square-faced drawer fronts with brushed aluminum pulls are standard. Optional full recessed (integral) pull drawer and fronts available. Optional pull-out (reference) posting shelves available. Ball bearing suspensions on pedestal drawers. Tops 1-1/4" HPL with standard T-Mold edging. Waterfall front top optional. PVC edge optional. Corners are 1-5/8" radius to accept optional break-away tables.